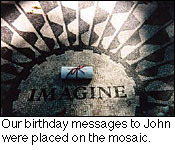 October 9, 1997 would have been John Lennon's 57th birthday and visitors to Bagism submitted the following birthday greetings to him. Even though John is no longer with us in person, he is obviously still in our hearts. 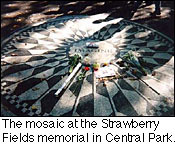 The birthday messages were placed on Strawberry Fields, the memorial to John Lennon in New York's Central Park. Many thanks to Sparky for dropping off the messages and for providing some photos of his visit. Wow! Has it really been a year since your last birthday? My, how time flies. I admire the way you lived the equivalent of several lifetimes in just 40 short years. You really made the most of your time here and that is something I try to emulate (but haven't yet mastered). Thank you and happy birthday! Happy 57th Birthday John! Your music still means a lot to me; it always cheers me up when I'm feeling depressed. All of us love you and miss you lots! Well, can't believe it's been 57 years. With you and without you John, you've given me and other's hope, happiness, inner peace, memories, smiles. You've enlightened my life, made it better, never a day goes by that I don't think of you and your music and your too-short life . . . . . . . . . . . . . . Hope where-ever you are, that you're happy and that you've seen how Julian and Sean grew up to become wonderful people. No-one can take your place, you are the original. Your music and poems and movies are all cherished by me, as a gateway to your thoughts and inner feelings, it showed all your different sides well. Thinking of you now and always " All you need is LOVE " " Imagine there's no heaven " " Mother, you had me, I never had you " " I am he as you are he as you are me and we are all together " " Let me take you down, " " Just like starting over " " Help! I need somebody! " " There are places I remember, all my life " " Come together, right now, over me " " Turn off your mind, relax and float downstream " " Words are flowing out like endless rain into a paper cup " " Picture yourself in a boat on a river with tangerine trees and marmalade skys " " I read the news today, oh boy " Sections of your life, put so well, thank you John. Happy 57th Birthday, John!!! I'll never forget you! I love you with all of my heart! I know that even though your physical body is gone, your spirit lives on which is why I know you're receiving all the positive energy of these birthday wishes. Thank you for all you contributed to this world. It seems to be an endless spring perpetuated by every generation that survives on this earth. Like it or not, you have been immortalized. I know you would probably be opposed to the idea, but c'mon John, who doesn't like a good birthday party!! So put on your party hat, blow out the candles, & make a wish... I wish for peace. John, your legacy will live on forever. No one could ever take your place...you are an inspiration! There has been many, but you will remain at the top for ever! A different class altogether. The greatest, John Lennon You will never be forgotten. I miss you John -- you're always in our hearts. Peace. you say it's you birthday! happy b-day john and hope you are having fun up there *s*! Dear Yoko Ono, Your strength and nonconformity is an inspiration to us all. I miss John Lennon for his musical, political, and theological genius. Thirty years later,all you still need is love. 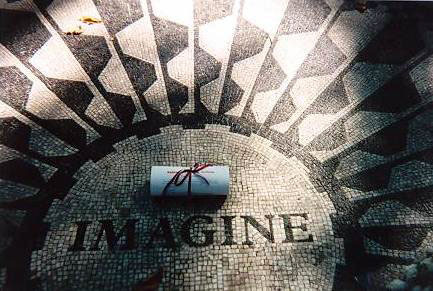 Twenty-five years later, let's keep imagining. 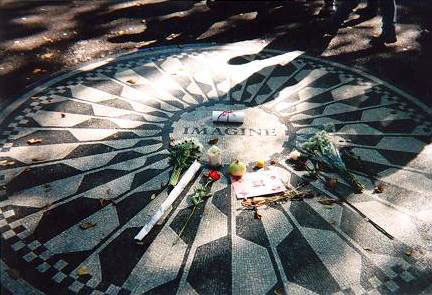 Seventeen years later, let's keep crying and missing John Lennon. Forever and ever. Jai guru deva. Happy Birthday John. #9 Dream. Give Peace A Chance. John~ Even though I never knew you, or was born to, I miss you! Hopefully, someday in some way we'll meet. Although that was probably the corniest thing that I've ever wrote!!! Peace and Luv to you John! John: HAPPY BIRTHDAY TO YOU!, deseo que en este dia estes tan feliz como yo, espero que algun dia no muy lejano podamos compratir este dia, y ese dia te dare mi mejor regalo, ahora no importa que no estes fisicamente porque tu estas en mi mente, en mi corazon y en mis sue~os. SABES QUE TE AMO. Dinora. P.D. :I know you can understand Spanish, so you won't have problem to read this greeting for you. John, HAPPY BIRTHDAY!!!!! I hope that on your b-day people could have a day of peace to comemmerate you! I know I'll try!! John, happy birthday, my love, you're my angel... i love you too much, but i couldn't love you any less. one day we will meet... bless you, wherever you are... i love you so much, you know the rest. All You Need Is Love, Briana . i love you, i love you, i love you words cannot express. tears. Happy Birthday John where ever you are. Thank you for the Music and the Dreams!!!! Remembering John Lennon on his birthday. I feel sadness at his early departure from us, but I am also grateful for having known something of the living person that he was. The rest surpasses human understanding. Time to recommit to living the ideals that John advocated. It is amazing that many years have passed since John walked amongst us and people are still "Coming Together" as he wished. This is the ultimate testament to his living years and I'm sure it is what he would wanted more than anything. On this his 57th birthday I dedicate myself further to realizing John and Yoko's dream of Nutopia. I will walk with peace in my heart and love in my soul for all my brothers and sisters. Thank you John wherever you may be now. HAPPY BIRTHDAY, JOHN. WHEREVER YOU MAY BE! I can't explain in words how much you've changed my life and many others. By doing our best to carry on your legacy, I and others with the same frame of mind hope to express your pure genius and talent that was taken too soon. Happy 57th birthday, John. Legends never die. I don't think there is anything that hasn't been said... Happy Birthday and we love ya John! Remembering you on your birthday...and happy birthday to Sean, too. John- There are no words that could even begin to express how much you have helped and influenced me. I love you and your message so much. The only gift I can think of to give you that you would really want is to spread love and peace everywhere I go. I hope that wherever you are, you're celebrating a wonderful 57th. No one will ever forget you. My thoughts are with you and Yoko now. Johnandyoko forever! -Ashley "Lennon"
Happy Birthday John. You've meant so much to so many people through your music and your ideas. You will never be forgotten. Your music will alwasy live on. Remember- you made a diffrence. Even today, all you need is love. Happy birthday John....we miss you. Dear John Happy 57th Johnny!! !,Thank you from the bottom of my heart for all the joy your music and ideas have given me.I miss ya,but in a way your still here.Not long ago I recorded a song in your honor and I knew you were there,just checkin it out.Well I hope ya liked it.Anyway just wanted to add my congrats,I love ya brother.PEACE!!!!! Dear John, Happy 57th birthday Mr. Lennon. Your memory lives on with your music with The Beatles, and also with your solo music. You are one of the all time greats, and will never be forgotten. Hopefully one day your dream will come true and the whole world will Give Peace a Chance. I was only 14 months old when you passed away, but yet through music and film, you've still been one of the most interesting and influential figures in my life. May you forever rest in peace. Mr Lennon, you will never be forgotten. Thank you for all the hope your music has brought me. PS expect a letter from my grand children in 50-something years! HAPPY BIRTHDAY JOHN. I MISS YOU BUT UNTIL WE MEET THERE IS THE MUSIC TO LISTEN TOO. WE ALL SHINE ON. Happy birthday John! We miss you! Dear John.Happy Birthday! !I love you so much and although I never met you, you had and still have a huge influence on my life. You were one of the most amazing people to ever walk on this earth.You will be remembered forever. John, we've all Come Together...over you. 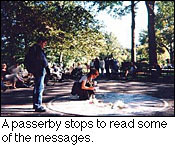 You and Yoko sacrificed your privacy to bring a message to the world. Don't worry, it wasn't in vain. There is more love because of all that you did in your life. Thank you for being. Happy Birthday to you John! Your music has touched my life forever. I wished I could of seen you perform live. You have brought me much joy by your kind music. Thank you for sharing with us your wonderful talent. You are missed so very much. Thinking of you on your special day... I would also like to wish you, Sean, a very Happy Birthday to you! Happy Birthday, John. You are greatly missed. Happy birthday , John !!!!!! Thank you for the music you left for us and the generations to come.When I was younger my father shared your music with me and after my parents death,when I was four, your music helped me to rember how much my father loved me.Thank you . Happy birthday, John...You're the greatest. Cheers. Happy Birthday John!!! You're the grooviest! Thanks for all that you've given us! It makes me think of the good old days. Happy Birthday To You! You've sure grown out of your baby ways. Happy Birthday to you! Cut the cake,let's eat some more. Happy Birthday To You! Happy Birthday, John! The first time I ever heard a Beatles song, it was "Strawberry Fields," and I fell in love with your voice. When I learned about the man behind the voice, I knew he would always hold a special place in my heart. I hope that where ever you are, you have found the peace you greatly deserved and earned. Thank you for all your contributions and for your beautiful words that brought me and many others peace. John, although your loss is still keenly felt by me and your legions of fans, we have the privilege of your music and legacy. Our admiration grows for you continuously and will continue to do so, while at the same time we recognize your frailties and foibles. They only endear us to you more. Please know we'll always love you. John, Words can't express what you've meant to me over the past few years. Although you are gone, your legacy lives on in us, your fans. Anyway, have a rockin' birthday. I'll be celebrating, as I'm sure a lot of people will be. "Yes we're going to a party party." John, Although I am young and never had the chance to share the world with you (for you had died before I was born), you have had the greatest impact on me. You are my idol and a great part of me. I would not be who I am today if you had not existed for that far too short period of 40 years. You have had more of an influence on the way I think, feel, and act than any other person, living or dead. And it brings tears to my eyes to think that you are gone. The world could have been a better place if you were here now to continue your gallant efforts. I know that you were not a saint, but you were a very interesting, complex, and good person. You are a very important part of history, yet, you are not history. History is the study of things in the past. But you are in the present, for you live on in my heart and in my soul. There is a little bit of John Lennon in all of us whether we realize it or not. Although I never got to meet you, you have always been my favorite person. You stand for so many things that people in this day and age cannot begin to understand fully. Hope, love, peace, creativity. But most of all, you had individuality. And in a society where being normal is oh so important, you broke those barriers and changed things. For you, it was a small thing to do. You were just being yourself, a genius, John Lennon. But to me, it was much more than that. What you have come to stand for to me is just too awesome to express in words. I cry as I type this, as you watch down from heaven, I'm sure you can see that. It is very hard for me to write how I feel, but I feel that I must thank you for everything. To put it simply, I love you. I LOVE JOHN AND ALL THE GREAT CONTRIBUTIONS HE MADE TO THE WORLD. HE'S MY TOTAL IDOL AND I KNOW HIS LEGEND LIVES ON. flower power and //0-0\ forever!!!!!!! Happy Birthday, John! Your music and words still touch the world although it's been nearly 17 years. You are loved dearly and missed. You will always shine on! You will always be my hero. Even though I was only a few weeks old when you were viciously murdered. Lots of love. happy birthday john winston ono lennon happy birthday to you fifty seven years, ocean child calls you, should have been here I love to turn you on, love you so much, yeah yeah yeah, we all shine on and so do you when you're busy making other plans in strawberry fields forever in my life, give peace a chance, and all you need is love in my life, I loved you more, so I sing a song of love, beautiful Yoko and beautiful Sean. Love you, miss you. Happy birthday John and Sean!!! Yoko, as you remember John on his birthday as we all will, I know you're at peace knowing you were loved so much by such a wonderful man. I am thankful on this day for John being a part of this world for too short a time. His words, music and philosophy has had a tremendous impact on my life - the world is a better place because of John Lennon. Happy Birthday John! Thanks again for your gifts to us. I hope that wherever you are you know the impact you've had on us all, and it somehow sweetens the bitterness you occasionally tasted in life. Your work made a difference. Happy B-day Johnny Boy! Although you are not phsysically with us your apparation is present upon this earth. When we look up into the midnight sky, let you star twinkle and shine as bright as the others, because no other shines like you. Thanks for inspiring my life. You were and still are proof that hopes, dreams and desires can come true! Peace, Love and Happy Birthday! Happy Birthday, John. You will always be remembered. I'm not sure how you would feel about all the fuss made, but it should be comforting to know just how many lives you touched and the difference you made. I know you've touched my life and have been there for me by way of your songs and inspiration. Happy Birthday, Sir Winston O'Boogie! We owe you many things. Thanx for sharing your philosophy with us. We've reached complete happiness, as you did. You are still here. Happy birthday, John. Happy Birthday John! You have changed all of our lives!!! Thank you, John, for changing all of us for the better. Johnny, Happy Birthday! Wow, 57 years old! It's great to be able to celebrate your birthday. You are one of the most important figures in my life. I wish I could give you the present we all know you want, but right now we can only work on it. Thanks for everything you did for us, thanks for your music and above all happy birthday and many more! Your a legend!!! Happy Birthday John. You certainly are the 'toppermost of the poppermost.' You touched a world that was in need of hope and peace. You still touch us through your words and music. You will never be forgotten John. As long as music plays and peace rallies gather, you will be remembered. Thanks for the good times John! John, wherever there is life, there is you...whenever there are flowers, there is you...whenever there is goodness...there is you. Within your music, there is you... May you enjoy your birthday, and we all wish that we could say, to you, on your special day... ...there are you. "..I'm glad it's your birthday. Happy Birthday to You!" 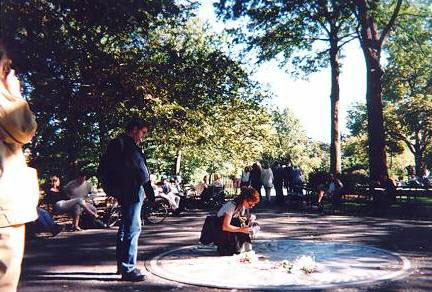 Hello to all the people in Strawberry Fields. Happy birthday John and Sean. Nothing's gonna change our world. Happy birthday mate! You will always be my hero, even though I'm probably one of your newest 'fans'...rest in peace mate, wherever you are...I'm trying to imagine there's no heaven, but I know that if there is, that's where you are right now! John, You have been my inspiration for so many things. You are my hero and my friend. I know, I was just less than a year old when your great life came to an end. But I feel like I have known you, as though, you were always there. Thank you, for making my life a better place. I will always love you. If I had only one wish.. I wish you were here..
"....Love is knowing we can be Love is free free is love Love is living living love Love is needing to be loved.." You will always live on in our hearts. WE LOVE YOU JOHN!!!!!!!!!!!!!! "Love is real......"
Thank you, John, for everything you've been courageous enough to do. I respect you greatly and your music is the best I've ever heard in my entire life. We all miss you and I would have loved to have lived in your lifetime and directly experienced your influence. Happy birthday, John, wherever you are (and happy birthday, Sean)!!!!! You lit the candles of inspiration for all. Even though I did not exist during your short life I still feel your impact in my life. Thank you for all you did and will continue to do forever. I send all my love, Melanie C.
Dear John, Happy Birthday, Baby. Even though you will probably never see this, i feel honored to even be able to write to you. My heart aches when I think of you, I cherish greatly the seven days I spent on Earth with you. "But of all these friends and lovers there is no one compares with you..."Happy Birthday. Happy Birthday to John Lennon. Who would have thought 17 years after his death, John Lennon would still have such a strong effect amongst us still here. His life and music have touched a whole new generation of kids and adults alike. His life has lit the path for all of us who thought we had no one to look after. I think that John Lennon is smiling down on all of us here, and knowing he accomplished a major feat: bringing the world a little bit closer together. So as I say these final remarks, know that I am not only sending it to John Lennon but to the entire world: I LOVE YOU. Happy Birthday Dr. Winston O'Boogie. We all love you and wish you were here.